TOA TS-901 Chairman UnitThe TS-901 is a Chairman unit of the Infrared Conference system. 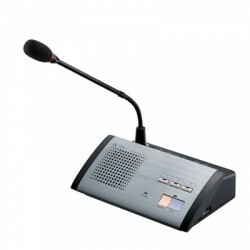 Since the s..
TOA TS-903 MicrophoneThe TS-903 is a designed microphone for exclusive use with the conference units..
TOA TS-904 MicrophoneThe TS-904 is a designed microphone for exclusive use with the conference units..
TOA TS-802 Delegate UnitThe TS-802 is a Delegate unit of the Infrared Conference system. Since the s..
TOA TS-905 Infrared Transmitter/ReceiverThe TS-905 is an Infrared Transmitter/Receiver of the Infrar..
TOA TS-907 Infrared Transmitter/ReceiverThe TS-907 Infrared Transmitter/Receiver of the Infrared Con..
TOA BC-900 Battery ChargeThe BC-900 is a dedicated battery charger for the BP-900 (optional) used in..
TOA YW-1022 DistributorThe YW-1022 is a distributor that can work in the frequency range of 1.6 to 1..
TOA YW-1024 DistributorThe YW-1024 is a distributor that can work in the frequency range of 1.6 to 1..